Umbilical hernias occur in patients of all age groups. When this occurs the protrusion of subcutaneous fat and skin in the navel area, and in severe cases, gruzevich gate can be loops of intestine and omentum. This situation is accompanied by a number of unpleasant symptoms: pain, discomfort, etc. There are several methods of surgical treatment of this disease, however, the most popular and most effective among them is laparoscopic umbilical hernia with removal of the hernia SAC through small incisions. High efficiency of laparoscopic surgery leads to their widespread dissemination in clinical practice. On the anterior abdominal wall in humans is a few «weak» points, through which the formation of protrusions of the internal organs. One such place is the navel, located in the midline of the abdomen and formed a small amount of soft tissue covered with skin. Many people wonder: «do I Need to remove an umbilical hernia?». Indeed, if the disease has developed without complications and occurred in a child, the hernia can wait until 4-5 years of age. As a rule, this age period anterior abdominal wall is strengthened and alone the hernial SAC disappears. However, if the protrusion is large in size, there are complications or its volume increases, it is obligatory to be deleted. In the case of occurrence of a hernia in an adult, it is always subject to surgical treatment due to high risk of developing complications. Hernia can be impaired, leading to necrosis of the contents (bowel loops or omentum) and the development of severe consequences, including peritonitis. Removal hernia – a mandatory stage of their treatment to prevent the development of complications. Rapid recovery of the patient after the intervention. Minimal trauma of the soft tissues of the body. Low risk of severe complications. In connection with these benefits of using laparoscopy for the removal of umbilical hernia, preferably in any age period. Laparoscopic treatment is carried out in the following stages. Initially the skin of the anterior abdominal wall is applied to the incisions through which the surgeon will introduce a laparoscope and additional tools. The abdominal cavity is fed carbon dioxide. This increases the volume of the abdominal cavity, which improves the surgeon review and allows safer to perform all manipulations. The operation is performed under visual control, which is possible thanks to the camera mounted on the laparoscope. Observance of technology of laparoscopic operations allows to ensure high efficiency of treatment. Through gate right gryzenia bowel loops and mesentery back into the abdominal cavity. After that, the peritoneum is opened and begins the most important phase of the operation – strengthening of the anterior abdominal wall or hernia repair. This manipulation is necessary to prevent recurrence of the hernia. For hernioplasty can use the patient’s own tissue or synthetic material placed on the inner side of the abdominal wall. This allows you to safely enhance the body’s own tissues and prevent recurrence of the disease. At the end of the operation the peritoneum is sutured, the laparoscope and instruments are removed and the incision in the skin sewn with a. When using General anesthesia the patient is placed in a chamber, where he organized permanent surveillance. 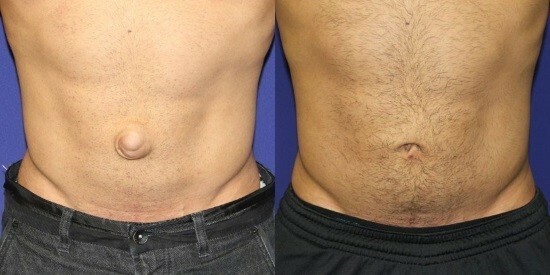 Removal of hernias by laparoscopy is the most modern and effective treatment, not leading to any serious consequences. Proper preparation of the patient and efficient operation ensures full recovery of the patient and lack of recurrence.